Building games are one of the most-popular video game genres on mobile and gaming consoles with a host of titles giving players the opportunity to design and create their own house, city, world, or even their own computer game. While online multiplayer and cloud saves are very much here to stay, there is still a lot to be said for building games that can be played offline whether you're playing on your smartphone and tablet, computer, or modern console like the Xbox One, PlayStation 4, and Nintendo Switch. Here are 10 of the best offline building games worth checking out. Minecraft is available on every gaming console and mobile platform. Loads of content to keep players occupied. The blocky art style won't appeal to everyone. Split-screen local multiplayer isn't available on all versions. Minecraft is one of the most-popular building games in the world due to its solid gameplay, continued evolution, and the potential it gives players to build almost anything they want. On the surface, Minecraft looks like a basic retro-style pixel artwork creating tool but its 3D digital spaces allow for the creation of some truly epic worlds that can be fully explored by players and shared with others (though sharing does require online connectivity). In addition to building structures and worlds, Minecraft also teaches problem solving skills through its crafting mechanic that requires players to mix and match certain objects to create new materials. The addition of levers, train tracks, water, and animals add even more to the experience. One of the biggest collection of playable characters ever made. Some truly advanced game design tools available for players. Load times can be slow on console and older PCs. No local multiplayer on the PC version. The Disney Infinity video game series may have been discontinued but that doesn't mean that its last entry, Disney Infinity 3.0 isn't worth your time. Disney Infinity 3.0 features a ridiculously large cast of characters taken from Disney, Star Wars, and Marvel franchises which can be used together in a variety of game modes and stories. The console versions require the purchase of the physical toys to unlock the characters and levels but the Windows 10 version on Steam features all of the content completely unlocked for free. In addition to the tradition gaming experience, Disney Infinity 3.0 also boats a collection of impressive creator tools that allow players to create not just their own world but even their own video game with trigger points, vehicles, camera controls, and a massive library of assets based on Disney properties. Because Disney Infinity has been discontinued, a lot of the toys and Playsets for the console versions can be bought for very cheap prices in gaming stores and on Amazon or eBay. Freedom to be as ambitious as you want with the city design. Cool stylized art style that makes the city look great at night time. Parents should be wary of in-app purchases ranging from $1.99 - $119.99 per item. The design of the natural environments and plants leaves a lot to be desired. Designer City is cool city building sim designed for Android (and iOS) smartphones and tablets. On the surface, Designer City looks like a typical Sim City or Cities: Skylines rip-off but, on closer inspection, the differences become apparent. While most other city building games place a heavy emphasis on resource management and the citizens, Designer City gives players the option to just build a metropolis that looks good without the restrictions of other titles. Players can enable additional rules to create a more realistic experience if they want to but the focus here is on having fun and designing the city of your dreams, not being the most efficient mayor around. Very easy to pick up and play. Support for iOS 7.0 operating system. Strong emphasis on in-app purchases starting at $2.99 to speed up building tasks. The game's graphics look like most other building games. Village City Island Simulation is a building sim video game for iOS (and Android) devices that lets players create their own waterfront city. There are over 100 buildings to unlock and add to your city and constant challenges and tasks relating to citizen happiness and requirements to keep you busy. Village City Island Simulation is completely playable when offline and works on Apple's iPhone, iPod touch, and iPad devices. This building game also supports older devices running iOS 7.0, which should please those who haven't upgraded to the latest smartphone or tablet yet. Loads of content to keep even the experienced builder entertained. Cities: Skylines plays in 4K Ultra HD on the Xbox One X console. Game can slow down on older machines once the city begins to really grow. Console versions are lacking some content from the PC version. 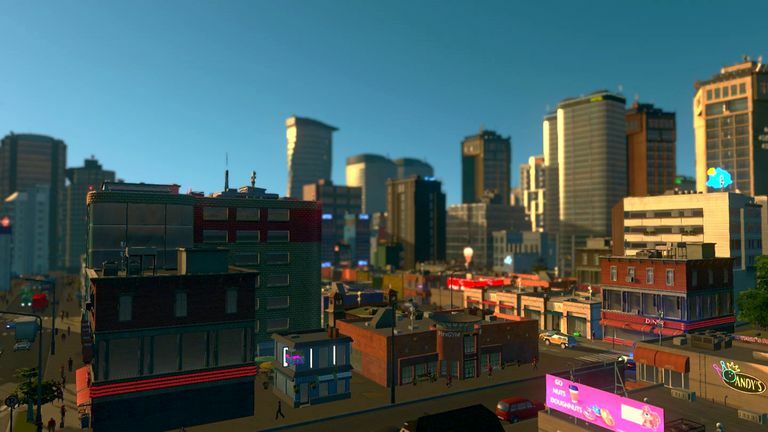 Cities: Skylines is considered by many to be the best city building video game on modern consoles, even surpassing the famous Sim City franchise. The game allows for the creation of a city from the ground up and allows for some seriously indepth management of city design, resources, traffic, taxes, and population control. Cities: Skylines is available on PC, the Nintendo Switch, PlayStation 4, and the Xbox One. Great mix of classic and modern Disney characters and rides. Very easy to play for inexperienced gamers. The limited time events are impossible to finish without spending $5+ on in-app purchases. The first few hours of gameplay are pretty boring. Disney Magic Kingdoms is a free-to-play video game for iOS, Android, and Windows 10 devices that lets players build and manage their own Disneyland theme park. Unlike most other theme park building games, Disney Magic Kingdoms ignores the mundane tasks of actually managing a Disney park and instead focuses on unlocking rides and characters while cleansing the location of evil magic. Disney Magic Kingdoms does have frequent events which require an online connection but most of the game and its content can be played offline. New characters are also added on a very regular basis. Fully-feature theme park creation and management tools. Cool retro art style that will appeal to older players. Unavailable on any Xbox, PlayStation, or Nintendo consoles. The amount of options may intimidate casual players. The Rollercoaster Tycoon franchise is by far the most-popular series of theme park sims on any platform due to its in-depth exploration of theme park management and approachable ride creation tools. Rollercoaster Tycoon Classic takes many of the features from the first two games in the series and brings them together for modern gamers on PC, Mac, and mobile while retaining the look and feel of the original entries. Loads of content to use from almost all past Super Mario games. Guest characters from Splatoon and Zelda games keep things fresh. The 3DS version is missing some content from the Wii U release. Ambitious game designers may feel restricted by the level limitations. Super Mario Maker is an official video game by Nintendo that lets players create their own Super Mario Bros levels on a Nintendo 3DS or Wii U. Characters and level assets are available from every generation of Mario video games from the 80s through to the 2010s and the art style can be switched on the fly from old-school 8-bit graphics to modern 3D interpretations. There is some internet functionality in the Wii U version that allows players to share their level creations with others online but most of the game is completely playable offline. The 3DS version is limited to sharing via the StreetPass local wireless connection. Just as fun to fail as it is to succeed. The mini-games are a bit lacklustre. Graphics a fine but a bit dated. ScreamRide is a first-party video game from Microsoft for their Xbox One consoles that tasks players with designing ambitious rollercoaster rides and then testing them with a cast of amusing Sims-like characters. These digital volunteers will either cheer if your ride is well-designed or scream hysterically as design flaws cause the rollercoaster to fall apart or explode. Either way, the results are entertaining. Lots of freedom in world creation. Huge library of characters and LEGO sets to use. Loading times can be very slow. Controls can be a bit fiddly. Unlike other LEGO video games which tend to follow a set storyline and characters, LEGO Worlds tries something different by letting gamers create their own play area to explore. Players can fully customize the terrain of the world they start with and there's a truly massive library of classic and modern LEGO toy sets to unlock and use. This is a game that encourages creativity and imagination yet still guides the player with instructional tasks and tips to prevent things from getting too overwhelming. LEGO Worlds is available on Xbox One, PlayStation 4, Nintendo Switch, and PC.